Have you ever wondered what the point of getting access to your records is? You can hear about all the potential benefits there might be as well as the challenges. But sometimes, it's just easier to hear somebody else's personal story - how it helped them and why it has helped them. This is a page dedicated to patients at Haughton Thornley Medical Centres describing in their own words what Records Access means for them. Please read their stories and then think about whether you should also consider getting access to your records too. 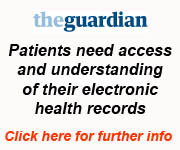 If you would like to know how to get access to your own records then please click here or got to www.htmc.co.uk/getaccessnow. If you would like to send your own personal story then please send an email to htmcpatient@nhs.net and we would be happy to share it with the world. This is your practice. This is your life. This is your story. In your hands. Read about G H who at the age of 65 following an emergency admission into hospital requiring the insertion of a cardiac pacemaker, got himself a computer in order to get access to his records. He and his wife learned about how to go online and then found many other useful information which helped him to regain his interest in gardening, change his lifestyle and now feels much better and are enjoying life together. His blood pressure has improved too as a result! Read about the mother of twins whose son developed blisters and needed urgent care. He had previously needed to go and see a dermatologist to get the correct treatment. Now she simply had to log into her son's record and share the relevant history, correspondence and medication with the doctor to save time and get the right treatment quickly and easily. Happy parent, happy child and happy clinician. Read about Mrs K M who describes her husband's health problems including previous heart surgery which means that when he gets chest pains, there is a worry that it might be his heart again. Access to his records means that he does not need to see the doctor immediately or worry if he cannot get in to be seen sooner for non-urgent problems. She also suffers with knee pains but knows that surgery is not an option yet so she has to try to make do as best as she can. She is the main "family health manager" and is able to order prescriptions, book appointments, learn about her own conditions and her husband's and manage things herself as best as she can. This helps the family to keep going. Read about Mr JC, a patient with prostate cancer who is able to track his prostate cancer, his regular blood test results and provide them to specialists outside the surgery when they need them. Read about Mr R and Mrs G F and how they went to the hospital because the husband needed to be seen by a specialist. Following the appointment, he went to see the GP who knew nothing about the consultation at the hospital. The patient was able to check that the letter had not come and was able to take things into his own hands and challenge the hospital to ensure the GP was kept informed. Read about H N's wife who went for a pre-operative assessment and was asked her current medication list. Within a few seconds she was able to go online and show her repeat prescriptions and the benefits this accrued including encouraging the healthcare worker to ask for the same service for herself too! Read about D D who in March 2017 needed an appointment to see the doctor and was then referred for a Chest Xray. He decided to conduct an "experiment" to see what the experience was like and posted his findings on Facebook for all to see. She also did a presentation in 2011 at an NHS North-West sponsored event for patients and the public on her experience too. Watch her video as she describes to the audience what this means for her and how it helps her get the best from the local healthcare services. Here is a short video by Margaret Rickson aged 84 talking about what Records Access means for her. She was due to present at a conference but was too unwell to come and so produced this video in the hope that others may learn too. You are never too old to learn and do this for yourself but you do need a little help and support from the practice and the clinicians too! Read how the niece (from Australia) who had Power of Attorney of a patient of Haughton Thornley Medical Centres in a residential home who became terminally ill and how Records Access helped the neice to be kept in touch even though lived on the opposite side of the planet and was able to see what was happening almost in real-time as the record was updated and as her aunt gradually passed away. (Patients now have to apply for Lasting Power of Attorney including Health and Welfare to do this formally and legally).